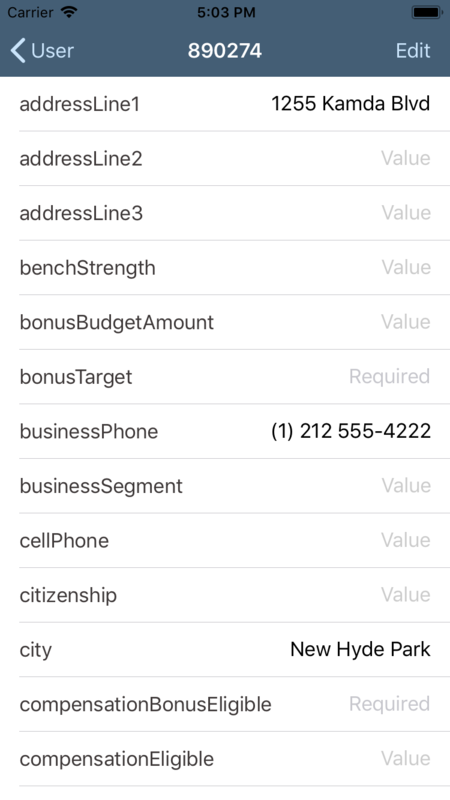 In our previous posts, we described the example Corporate Directory app that we built using the SAP Cloud Platform for iOS SDK; how we started the project in SAP’s Cloud Portal, and how we used the SAP Cloud Platform SDK for iOS Assistant to generate an Xcode project. 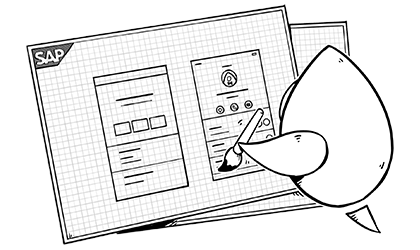 In this post we will describe how we customized the iOS project to meet our design standards and requirements. This ensures that the app will start with initial view controller from the User storyboard, which was generated by the Assistant. We removed the generated Main storyboard from the project since it was no longer needed, and updated code in the setRootViewController() function in the AppDelegate to launch the UserMasterViewController. We updated the User storyboard to enable safe area guides to ensure the app works well with devices that support FaceID. 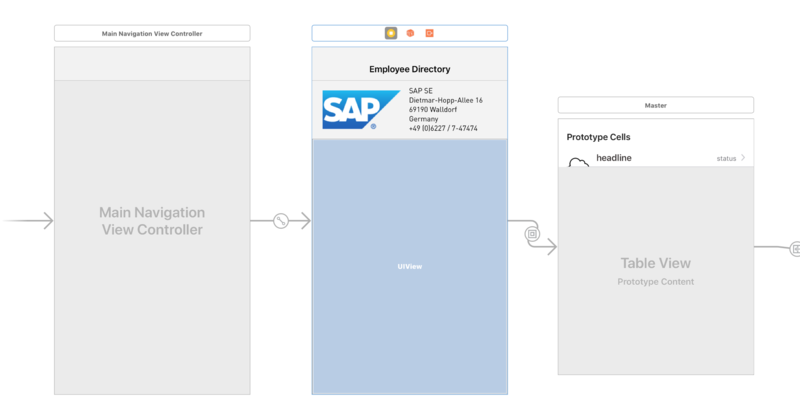 SAP provides a number of common user interface components in the iOS SDK, referred to as SAP Fiori Components. There is an SAP Fiori iPad app (called Fiori Mentor) freely available in the app store that demonstrates many of these components - we used it to explore and decide what might work for our purposes. As part of our goal for this project, we used as many of these components as possible in the project. let firstName = user.firstName ?? "John"
let lastName = user.lastName ?? "Doe"
cell.subheadlineText = user.title ?? "Employee"
To add the side index, we first needed to determine which letters needed to be in the index. We added some logic to iterate over the list of employees when it is set from the query; that logic creates a list of unique first letters from the each employee’s last name, and keeps a list of which employees are in each section as defined by the last name letter. We implemented the table view methods to have one section per letter, and correctly return the count of employees in each section. Then we implemented the sectionIndexTitles method to tell the table view to display the list of letters in the index on the right side of the table. let terms = controller.searchBar.text?.trimmingCharacters(in: CharacterSet.whitespacesAndNewlines) ?? "" let firstName = entity.firstName ?? "John"
let lastName = entity.lastName ?? "Doe"
profileHeader.subheadlineText = entity.jobTitle ?? "Employee"
Since we had an external source for the avatar images, we customized the generated User model object by adding the avatarImage attribute to generate a UIImage from our source. Once the header was in place, we decided to limit the additional information to a few set attributes - contact information first, then employment details. We used the FUIKeyValueFormCell for each of these pieces of information and just did minor styling work to it to make it match our design. What will we do next? For an app like this, offline capability is an important feature. We will be investigating the SDK’s offline features and integrating them into this app. When we build similar apps for clients, we typically ship a “seed database” with data at a known point in time, and then provide the ability to sync from there. This prevents the app from having to do a large initial sync, especially for non-transactional data. We will be investigating how to accomplish this approach using the OfflineODataProvider. We are also interested in exploring how managers can leverage HR data at their fingertips - there are lots of possibilities, including: capturing and reviewing data for performance reviews; reviewing department budgets and cost center performance (even being notified when estimates are exceeded or targets are hit); and being able to more closely manage key performance indicators without having to wait for generated reports or meetings. In addition, we will be exploring how we can leverage other Success Factors capabilities from SAP to build apps that extend the enterprise into the mobile space. An obvious direction is to use this same concept for client or customer contact information, and to consider what simple features (including basic order and delivery status) could provide strong customer service benefits. We would be happy to chat about what we did, and learn what you think would be valuable in a mobile app built with SAP’s Cloud Platform SDK for iOS. Contact us at martiancraft.com.